Ah… I just got back home from a quick long road trip to Atlanta to visit friends and family. As much as I love to travel and love the food I get to enjoy from faraway places, after a week I really crave a home cooked meal loaded with veggies. With summer here (at least here in Texas) I have been craving salads too. 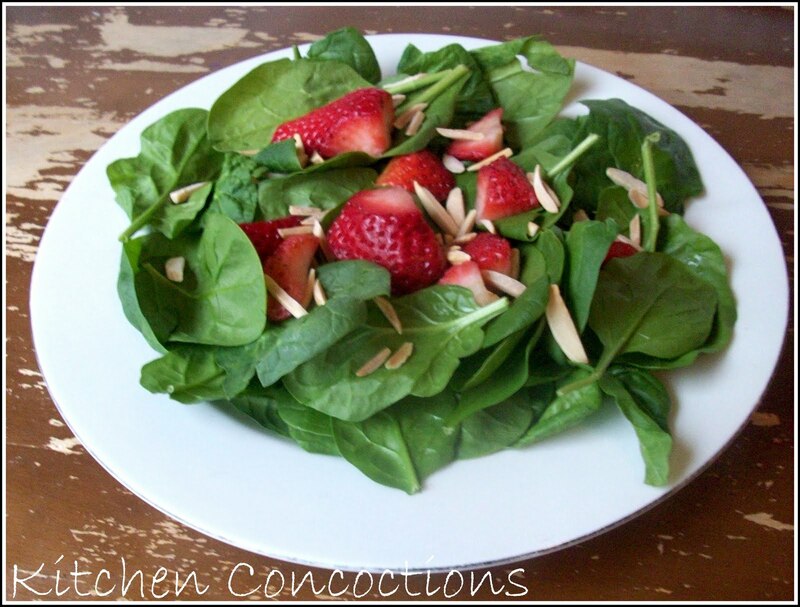 This Strawberry Spinach Salad with Balsamic Vinaigrette is perfect to fill both my cravings for a light home cooked meal loaded with fresh fruit and veggies. Who knew cartoon character Popeye, had it so right when it comes to eating the healthy and energy inducing green: spinach! This popular leafy green originated in the Middle East and was eventually brought to Europe and the United States by the Spaniards. In fact, for a while, spinach was known as “the Spanish vegetable”. Today, the Netherlands and the United States are among the largest commercial producers and consumers of spinach. Spinach contains impressive amounts of vitamins and minerals and is extremely low in calories. An incredible source of iron, potassium and magnesium ; spinach is also a great source of Vitamins A, C, B2, B6, as well as folic acid and zinc. With all these vitamins and minerals, spinach provides much needed strength and energy, builds strong bones, helps prevent diabetes and strengthens the immune system. Spinach is a rare vegetable in that it is available fresh year round. It is very inexpensive and is a common veggie found at all grocery stores and markets. When purchasing spinach look for bundles that have deep green leaves and stems with no signs of yellowing. The leaves should look fresh and not be wilted or bruised. When storing spinach, wrap spinach in paper towels and place it in a plastic storage bag. It is important not to wash spinach before storing, as the moisture from the water will increase spoilage. Spinach can be stored in the refrigerator for 3 to 5 days. There is a variety of ways to enjoy this great vegetable. As with most vegetables, spinach is best eaten raw to obtain the most nutritional value; it can be served in a fresh salad, on a sandwich in place of lettuce or added to a smoothie. Spinach can also be cooked by boiling, sautéing, or blanching. Cook spinach only until it begins to go limp and add it to pasta, casseroles and quiches. My favorite way to eat spinach is in salads. This Strawberry Spinach Salad with a balsamic vinaigrette is perfect for summer. Serve as an easy side dish or add grilled chicken for a light and flavorful dinner. Mix all salad ingredients in a large bowl. In a separate bowl whisk dressing ingredients together. Right before serving pour dressing over salad and toss to coat. I made your egg salad the other night for dinner! It was really good! Oh Rebecca I am glad you liked it! Sandwiches for dinner are great because they are so easy and inexpensive! 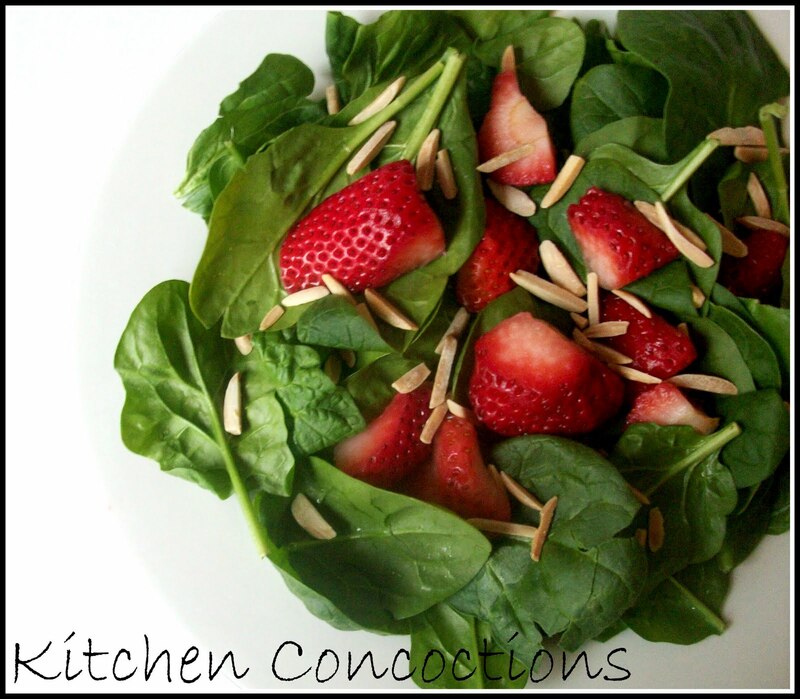 I love spinach and strawberry salads, and the balsamic in the dressing sounds fantastic!